What happens when you take the power of the camp experience and bring it to the heart of a congregation? Outdoor ministry leaders have been doing it for years, and it's time to truly find out what difference it makes. Christian summer camps have been offering residential camping experiences for children and youth since the 1880s, but traveling day camp is a much more recent and less ubiquitous innovation. Most Christian camps across the country offer traditional overnight camping experiences for children and youth. In a traveling day camp model, trained camp staff members travel to a community site, most often a church building, to run their camp program and activities offsite. These staff bring program equipment, Christian education curriculum, and participatory programming. They partner with volunteers and staff from the local congregation to bring the experience of camp into the congregational setting. Traveling day camp provides opportunities for young children to experience camp who may not otherwise have the time or resources to do so. Too often, young people experience camp as disconnected from their congregational experience. Traveling day camp emphasizes the partnership between these two powerful expressions of the church. It also allows opportunities for parents and community members to see camp staff in action in their community, including opportunities for them to participate in the programming. These interactions can help camp have direct impacts on the lives of families. Lutheran outdoor ministries have been operating traveling day camps since the 1970s as a way of strengthening the partnership between the camp and congregation, as well as providing opportunities for more young people to experience camp programming. What are the impacts of Christian Traveling Day Camp programs on congregations, families, and young leaders in the church? We are so glad you are joining us for this exploration of Traveling Day Camp, whether you are a camp director, church professional, or parent who has been asked to participate in the project. See the intro video from project director, Dr. Jake Sorenson. There has never been an inventory of programs or an assessment of best practices, and now is the time. The long history of partnerships between day camps and congregations is unstudied empirically. We are the first to examine the impact. It needs to be studied to celebrate what is working well and shape future programming for maximum impact. The outcomes of this project will change the way we do day camp by driving our learnings back into the organization and spreading the news of best practices to other camps and ministry partners. 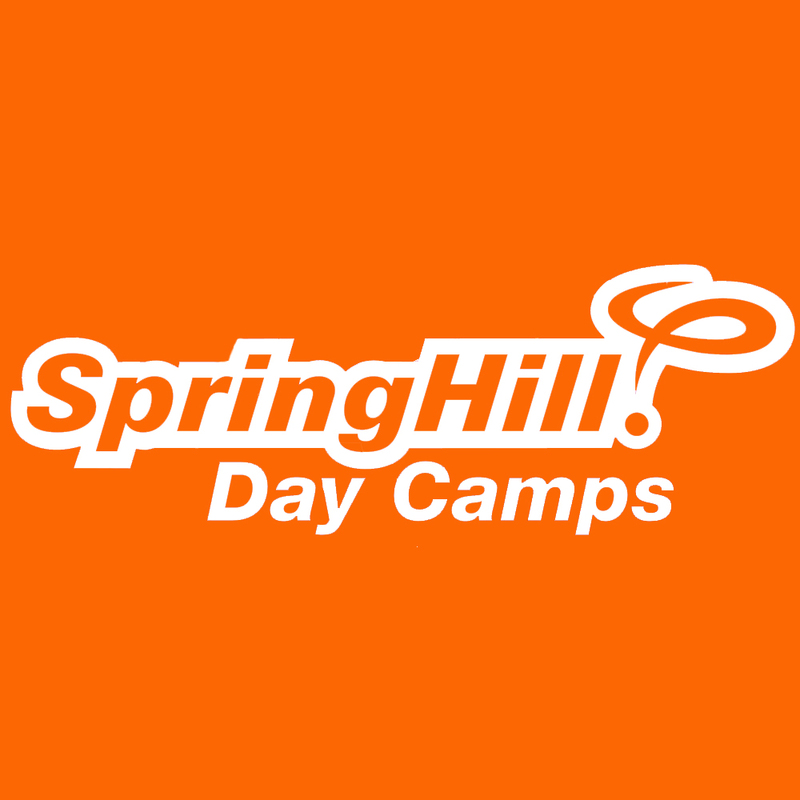 SpringHill is a youth outreach and discipleship ministry that uses immersive experiences (residential camps, day camps, leadership development) and a proven method (The SpringHill Way) to impact lives and prepare the next generation of Christ-centered leaders. Their mission is to glorify God by creating life-impacting experiences that enable young people to know Jesus Christ and to grow in their relationship with Him. Ministry-wide, SpringHill ended Summer 2018 with more than 25,000 campers and employing 1,000+ college-age staff. Their traveling day camps partner with 126 congregations and ministries across nine states. Their overnight camps in Michigan and Indiana serve nearly 10,000 campers annually. 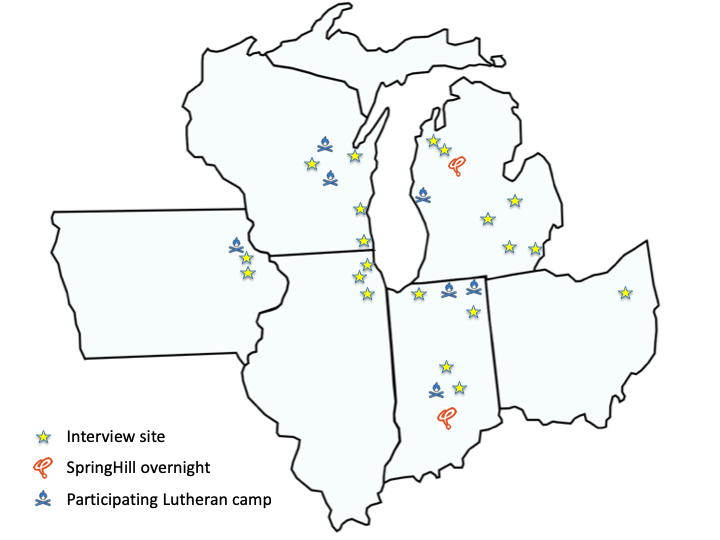 Our study centers in the upper Midwest, anchored by the two SpringHill overnight camps in Michigan and Indiana. Four additional camps, all affiliated with Lutheran Outdoor Ministries, are also participating: Crossways Camping Ministries in WI, Living Water Ministries in MI, Ewalu Camp and Retreat Ministries in IA, and Lutheran Outdoor Ministries of Indiana and Kentucky. 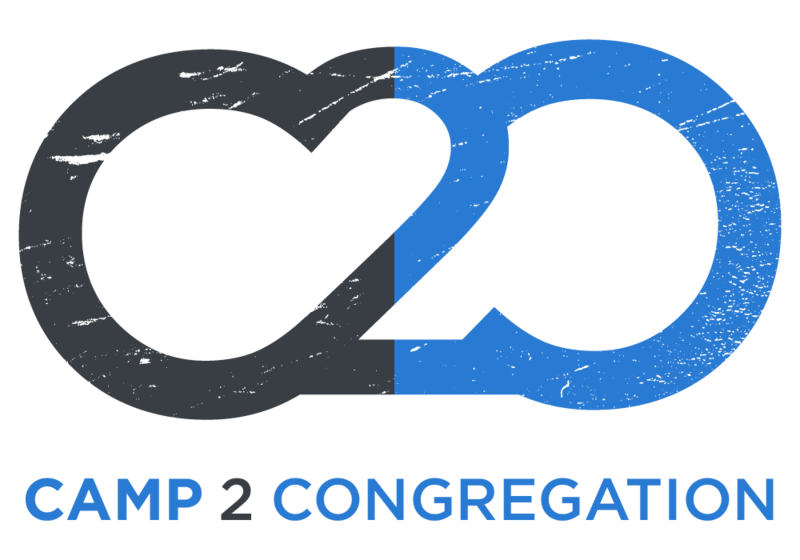 In Spring 2019, we interviewed congregational leaders at 20 day camp sites. The locations are shown in the map at right. This project will use an embedded mixed-methods research design aimed at assessing the variability, impacts, and best practices of traveling day camp programs in Christian camping ministries. The study will center on the programs of SpringHill and also include programs from four other camps. The methodology will use overlapping qualitative and quantitative research strategies, which will in some cases be convergent and in other cases be sequential. Each element is separated into six dimensions. This dimension aims to uncover the scope and variability of traveling day camp programs across the country. It is important to understand how traveling day camp programs have evolved over time and what might be considered best practices. This is an exploratory dimension seeking to understand the impacts of traveling day camp from the perspective of congregational leaders. We will interview leaders from 20 different day camp sites in order to get their perspectives on the benefits and impacts of the ministries. Researchers will visit 16 day camp sites during their week of operation in summer 2019. Visits will include program observation, focus groups with participants, and interviews of staff members. This dimension aims to assess the impacts of the day camp experience on individuals and families. We will use a test-retest methodology to assess growth and program effectiveness. Parents will complete surveys before and after the traveling day camp experience. This dimension will assess the impacts of working on a camp summer staff in a role focused on traveling day camp, specifically related to congregational engagement and attitude toward the congregation. This dimension will also assess the extent to which working on camp staff contributes to the development of Christian leaders. This final survey of congregational leaders will be designed to assess the effectiveness and ongoing outcomes of the day camp experience in the congregation and community. The intention is to allow two or more months to pass in order for congregational leaders to reflect back on the experience and observe any ongoing impacts. Jacob Sorenson is the founder and director of Sacred Playgrounds, a ministry offering research and training to camps and congregations. He has a PhD in practical theology from Luther Seminary, an Mdiv from Princeton Theological Seminary, and more than fifteen years of experience in camping ministry and congregational youth ministry. He has directed multiple research projects related to camping ministry, including the Camp2Congregation Project. Amber has been a member of the Sacred Playgrounds team since 2015. She serves as the research coordinator in the Camp2Congregation Project. She will also be one of the primary site visitors. Abby Sytsma will act as Program Coordinator on behalf of the SpringHill Team for the grant period. This role will maximize the impact of the research study by allowing SpringHill to devote a staff member to facilitate change. Sara VanWinkle is the Day Camp Divisional Director for SpringHill. She will inform and support the work of the grant in her role as director of day camp operations. 2018 marked her eighth summer with SpringHill. Connected camp leader? Caring parent? Curious church leader? Click below to send us an email to learn how you can help. And, be sure to check back later this year as we begin to rollout results of the project.  Follow and use the #camp2congregation hashtag in your social media platforms to start or join a conversation online on Facebook, Twitter, Instagram, or YouTube.